Whether going on vacation for several weeks, or a short business trip for a few days, Bear Brook Kennel offers the best when it comes to comfort and care of your dog, cat, or exotic pet! We at Bear Brook Kennel strongly believe in treating your pets as if they were our own! So, if the road is calling you -- go ahead and go! Let us at Bear Brook Kennel help you make the time away from your pet worry free. The staff at Bear Brook Kennel is committed to help you ease the anxiety of separation for both you and your pet. Your pet will receive quality care from our Kennel Technicians, Groomers, and Receptionists. Your pet’s sleeping quarters, meals, and grooming will all be carried out to your specifications. Your pet is our guest! The choice is up to you. 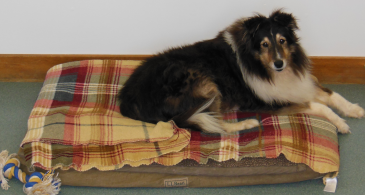 We offer a variety of sleeping quarters for our canine guests. You may choose an indoor/outdoor enclosure, a Vice Presidential Suite for our smaller guests, or our Presidential Suites. These large indoor/outdoor suites offer all the comforts of home for one or more dogs. Our Feline guests have the luxury of our towered suites standing 6 – 7 feet high! Each spacious suite has plenty of shelves to climb on and glass doors to watch the nature outside in our fields. We provide a high-quality food for our boarding guests at no extra charge. If your pet is on a special or prescription diet due to allergies or a sensitive stomach, you’ll want to provide his/her food. If you decided to bring your own food, please pre-package it into individual meals. Most people use Ziplock bags labeled with your pet’s first and last name on them. 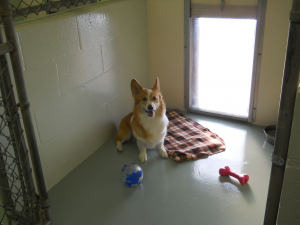 Please do not bring in blankets, beds, stuffed toys, or anything that can be destroyed by your pet in the kennel. We have blankets and mats here that we provide. These items are easily washed. A few non-destructible toys are acceptable. 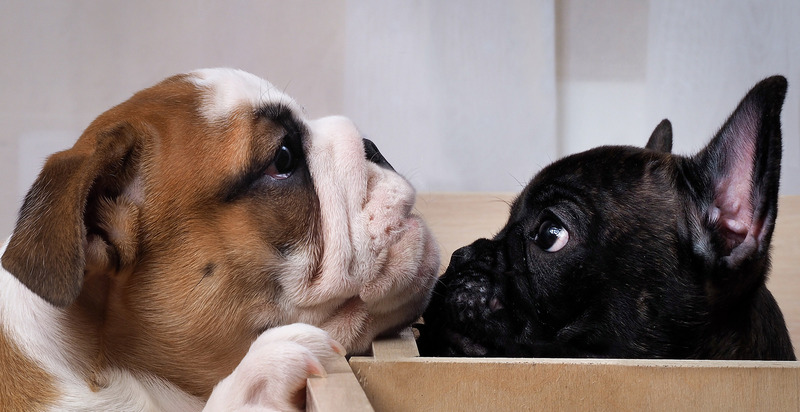 Even dogs who do not chew at home can begin to chew in a kennel situation due to stimulation. Your dog has a few different options when boarding at Bear Brook Kennel, which are listed below. We also offer Walks or Play times for the dogs that board with us. Walks are usually 10 minutes with the kennel tech and are $5/piece. Play times are 20-minute play sessions with other dogs or alone with the kennel tech. Play times are always directly supervised by the kennel tech and are $6/each. Your dog will get a complimentary bath after 3 or more nights of boarding. If they board for only 1 or 2 nights, they get what we call a “touch-up,” which is a belly/legs/hind end wash. If you would like a full bath, please make sure you let the receptionists knows when you check in. The cost is $20 for a bath and $8 for a nail trim. We can trim your dog’s nails as well while boarding, for a discount rate of $8. 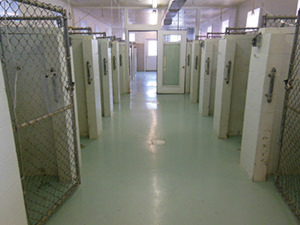 Regular Kennels. We have 2 kennel buildings with 24 inside/outside enclosures measuring 4 1/2 by 5 foot inside, and 4 1/2 by 12 foot outside. A plexiglass doggie door separates the two. Every pen is washed, scrubbed down, and sanitized daily inside and out. All the enclosures are secure and clean. All kennel floors have radiant heat throughout ensuring your dog is warm and comfortable. Inside Pens. We have inside pens we can board your dog in. They may seem unforgiving and not as spacious, but we give the dogs plenty of blankets to lay on and they are let out every hour to stretch their legs. These kennels can be used for dogs that have health issues, dogs that need to stay relatively sedentary due to something like surgery, dogs that have allergies to the outdoors (i.e. grass, pollen, dust, etc. ), or small dogs that may get very anxious out in the regular kennels. Presidential Suites. These are our higher end suites that are have tiled walls, sliding glass doors, a spacious outside area, and other special features. To learn more about these, please see the “Presidential Suite” tab under our “Boarding” menu. We encourage you to bring in some of your pet’s favorite treats! Bear Brook Kennel offers large, spacious suites for our feline guests. Each suite measures between six to seven feet high with multiple levels for climbing and comfort. A basket and soft blanket compliment these spacious sleeping quarters. Our cattery has plenty of windows that allow ample sunlight in to bask in the warmth in the winter. Cats will enjoy the coolness of air-conditioning in the summer months. Year-round Bear Brook offers top notch boarding under a watchful eye of our experienced staff. The cattery at Bear Brook Kennel is surrounded by large windows that let lots of natural light in. There are areas outside for watching the birds in the bird feeders. While your cat is our guest, you may want to schedule a toenail trim, bath, or the works. We offer full grooming for cats. Please see our Cat Grooming page for more information! A Roomier, Deluxe Option for Your Favorite Pooch! Bear Brook Kennel offers the option of boarding your Canine Companion in one of our Presidential Suites. Each suite is complete with a large inside enclosure with tiled walls, internet cameras, sliding glass doors, and a large outside yard with crushed rock. 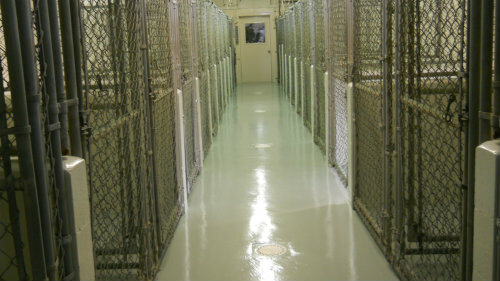 The Presidential Suites are more removed from the other kennels. The Suites are positioned in between the front and back sections of our kennels so they have their own separate area and the only other pets they can see are the other dogs that board in the Suites. A daily walk and playtime are included as well as a bath and nail trim whether they stay one night or many! Dogs can board in the Presidential Suite for any number of reasons. Owners may want that extra room for their pets, to be able to view them on the Pet Cams while away, or maybe their dog just needs a more secluded area to stay in. The Vice-Presidential Suite is a smaller Suite meant for small breed dogs. The VP still has a large outside area for the dog(s). It does not have a camera for online viewing. The VP suite also cannot fit the Kuranda beds that the Presidential Suite includes but we do make sure they are comfortable with blankets to lay on. The VP Suite also includes a bath and nails along with a daily walk and playtime! Why Board My Dogs in the Presidential Suite? The Presidential Suites book up very quickly. Book one for your dog today! Your dogs will also receive a free walk and playtime daily, so you can be assured he or she will be out getting exercised. 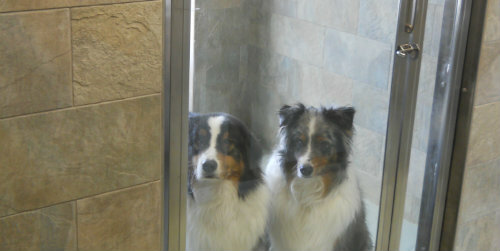 Before they go home, they also receive a complimentary bath and nail trim. Is Special Needs Boarding the right choice for my dog? A Special Needs Boarding pet may stay behind the Reception desk for additional care that they may need. He or she is monitored continuously by our staff when boarding behind our reception desk. Our caring team at Bear Brook Kennel recognizes that some pets require extra time, love, socialization, and familiarity with their health issues so we can appropriately address their physical, emotional, and medical needs while they board with us. For this reason, we offer Special Needs Boarding for an additional $5.00 per day. A Special Needs Boarding pet may stay behind the Reception desk for the additional care they need and are monitored throughout the day by our devoted staff. Bear Brook Kennel strives to give your pet love and attention in a safe, supportive environment so you will feel comfortable being away for a few days. We are only able to accommodate one dog at a time behind the desk for Special Needs Boarding. If this is something you would like for your dog, please call as soon as you know your plans, so we can see if we have availability. Regular kennels can fit 2 medium sized dogs (ex: Labs or Goldens) well enough but if you have bigger dogs or more than two dogs, the Presidential Suites are a great way to ensure your dogs can enjoy each others’ company without sacrificing space and comfort. View Your Pet from around the World! Bear Brook Kennels offers viewing cameras via the internet in our Cattery and our Dog Presidential Suites. As long as you have internet access, you can see your pet’s activity when boarding in these areas. These are still photos, not video. The cameras upload a new photo every 5 seconds. In order to see the new photos, click on the refresh button in your browser. These pet cams are best viewed in Google Chrome. If you do not get a new image by refreshing, you can try "Control" &"F5" on your desktop. Here you can download forms, so you can fill them out in the comfort of your own home instead of at drop off! Our consent form is a very important form because it has emergency contact information as well as other permissions, we need you to sign this before your dog is boarded/groomed/trained. The New Client Form helps us keep your contact information current.